Two years of juggling between work and studies, I terribly needed a respite. In the midst of completing my final year dissertation, I attended the 3 Nation Charity Ride held in Malacca, from 18th to 20th November 2011. Before this, I have never ridden beyond the state of Johor. It was my so-called first long distance ride on the Vespa. When the charity ride was first announced, riders from various motorcycle clubs and groups began gathering participants to form tables and ride up together. I looked up different motorcycle forums to see if there is a convoy I could join. Great. All of the groups were riding at average speed of 120km/h. I will probably seize my engine piston in the attempt hit that speed. Fortunately, Master Goh invited me to his group of friends who were willing to ride together at the slower than usual pace. In our group, there is Master Goh's African Twin, Sam and Ah Xiong on Yamaha Teneres, Ah Yee on Ducati Multistrada, Uncle Woo on Suzuki DR650, Jia Wei and Cheryl on Hayabusa. I am really really grateful to them all for accommodating my little lamb's speed despite their bikes are able to travel much faster. Throughout the journey, Uncle Woo and Sam rode in front and behind me like the fatherly and brotherly chaperones. At every petrol stop, they never failed to ask if I was tired or need a longer break. Once I refueled, in my zesty spirit, I always said I was ready to go. Weather played tricks on me during that virgin ride. It had me stopped to wear my rain coat over my mesh armour jacket and then to remove it when it became too hot. In the end, I simply could not be bothered any more and braved the rain to arrive in Malacca drenched. Then I learnt about this waterproof fabric called Gortex. I should have gotten myself a riding jacket made of this. To be stopping by the side of the highway and putting on your rain gears is not the wisest thing to do. Not sure if everybody knows this, on the Malaysian highway, the extreme left lane is actually meant for the perceivably slower motorcycles. However, most riders usually travel really faster with their superbikes on the first lane. Only slow coach like me uses them. It was quite nerve-wrecking in the beginning to be riding next to heavy vehicles travelling on the second lane. Many should know how fast a bus coach travels on the Malaysian Highway. Whenever heavy vehicles breaking its speed limit swished by, I could feel my little scooter being drafted into the turbulence. On the road, we cannot control other road users' action but we can anticipate other drivers' action and control our response to it. On the way, we were travelling behind a truck that was drifting in and out of its lane. If you spot this happening in front of you, what would you do? a) Overtake the truck and show the finger. b) Horn angrily and show him the palm, what the hell are you doing?! c) Just play safe, travel behind it at 40km/h until you arrived in Malacca. Igniting the wrath of another road user in a foreign country is probably not advisable. Master Goh who was in front of the convoy, horned and gave the driver a friendly wave as he passed. In any situation, give it benefit of a doubt, the driver may be dosing off at the wheels from long hours on the road, not trying to be a douche. "Just keep cool and smile lor." - Master Goh. Master Goh once shared with us how he had to maintain his smile when a surly custom officer threw paper documents at him and was making it difficult for them to cross the border. Lesson one - When we are in other people's land, we are at their mercy. Accept it! Losing your cool, kicking up a fuss over trivial issues will just get you into more trouble. I recalled another incident in which dirtbikers got chased by parang-wielding villagers in Malaysia. After 230km, 4hours ride with many breaks in between, we arrived in Malacca after braving through a series of rain. 4 hours ride to Malacca border, another 45mins ride into the town itself, we arrived at the hotel. The rest scrutinised the car park for a lot within complete view of the security guard. Lesson two - Ensuring a safe parking space is a valid cause for paranoia here. I know 3 friends who had their bikes stolen in Malaysia, including Master Goh whose bike was stolen before the big trip. A break to the handlebar lock and 2 guys to roll it quickly into a truck or lorry, that is all it takes. Ebony Rouge flanked by the handsome tourers. From left to right, Ducati Multistrada, Ebony Rouge the Vespa, Yamaha XT660 Tenere. She looks so diminutive here. A quick wash up, change into fresh clothes, free dinner at the welcoming party, followed by foot massage was a good way to end a day of riding. The next day, we had a massive bike convoy around Malacca Town. For once, we received presidential treatment in a foreign country. The traffic police escorted us and blocked the roads for the convoy to pass. At the post convoy lunch reception, I bumped into a few friends. 'One of them ask in surprise, maybe thinking that I have finally gotten myself a tourer, "How did you come here? *Pause to think through the bikes I owned* Don't tell me Vespa." I sheepishly replied yes. He face-palmed. Everybody asked me how long did we take to travel. It took most if them only one and half hours to two hours on big bikes! Iron Pony incongruous with the rest of Steel Steed from 3 different countries - Singapore, Malaysia and Thailand. The convoy was so long that I could not spot the end of it. Plus, we were escorted by the traffic police and roads were blocked for us to pass. In Singapore, I think you will only get that if you are the President. In the evening, riders from the 3 nations, Singapore, Malaysia and Thailand congregated at Makota Hotel for the charity dinner and auction. We didn't have enough food at the dinner so we explored Malacca for more local delicacies. At Jonker Street, we found some of out childhood delicacy and some obsolete toys. Master Goh found the gel that can be blown into a big bubble with a tiny straw. While waiting for the rest to reconvene, he was fiddling with it, using his mouth to create smaller bubble balls. And I found my favourite Ting Ting Tang 叮叮糖 and bought a few bags of Beh Teh So 马蹄酥 from San Shu Gong. Nostalgia! The next morning we had a quick breakfast before embarking the ride back to Singapore. Weather was awesome. Sun was not too scorching, there was no rain. The ride was perfect until I felt something not right - my scooter's rear was wobbly. Keeping my calm, I braked slowly to the side of the road shoulder. I got off to check my tyres. Bingo, I got my first flat tyre in 4 years of riding. Sam who was in front noticed that I was not keeping up and made a U-turn to check on me. “小妹，不要紧张。” "Little sis, don't worry." Uncle Woo who was behind, stopped and assured me. Actually, I was not in a panicky mode because one beauty about the Vespa is that it has compartments for spare tyres! I quickly removed the size cover to access the spare and dugged out the 13mm wrench from my glove box. Uncle Woo, who had been riding a Vespa for 20 years, took over from there like a pro. He covered the fuel tank cap with a plastic bag in order to prevent petrol from leaking while the scooter was on its side. Ah Xiong tilted the scooter, Sam helped to look out and direct traffic. 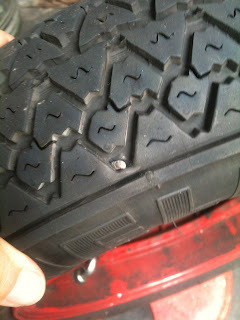 I would like to practise changing the tyre myself. However, I thought it would be faster if Uncle Woo did it so we could get out of the treacherous road shoulder quickly. As Uncle Woo removed the wheel nuts, I simply helped to pick up the wheel nuts and spring washers. 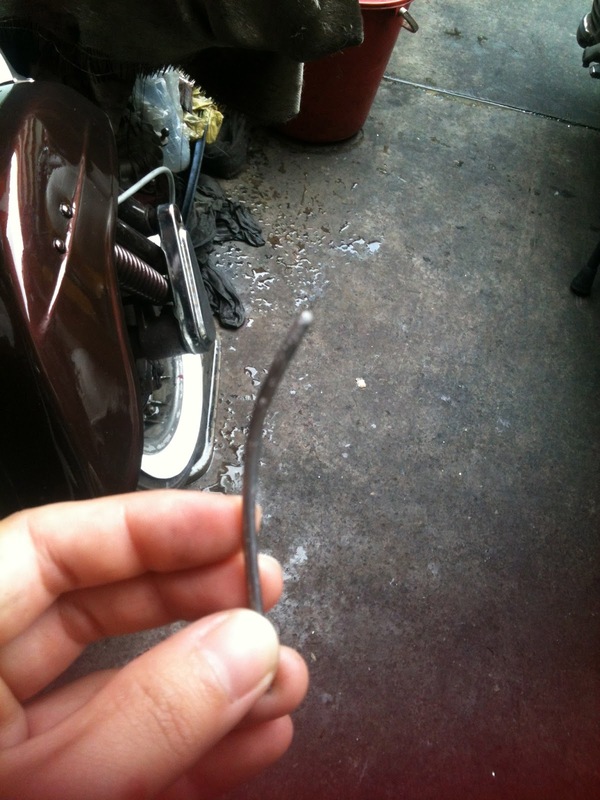 The culprit for the tyre puncture. The rest of the journey back to Singapore was trouble-free. The first jaunt on my Vespa and a few valuable lessons and tips gained for future trips. Understanding Ebony's fuel consumption and how she runs were some of them. This was just the start of many more trips to come. This post is dedicated to the memory of Sam Leong who looked after me a like a big brother in this trip.